Repeats every week every Monday and every Tuesday until Wed Jan 30 2019. Also includes Tue Feb 05 2019, Mon Feb 11 2019, Mon Feb 25 2019, Tue Feb 26 2019. Elders and Knowledge Keepers carry their stories, teachings, laws and songs within them to pass on to the next generations. We are honoured to support their visits to our campuses where they share their knowledge and experiences with our students and wider College community. Make connections with Indigenous Elders from the community. 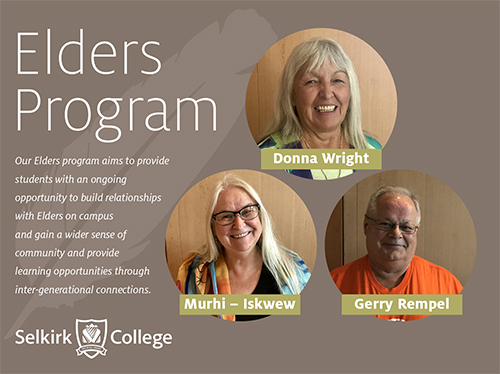 Meet Donna, Murhi and Gerry at the Gathering Place on the Castlegar Campus on Tuesdays. Drop in between 10 and 2 p.m.